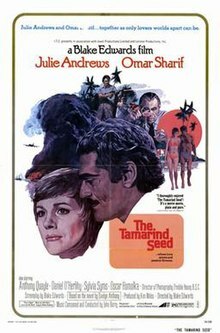 The Tamarind Seed is a 1974 American-British romantic drama film written and directed by Blake Edwards and starring Julie Andrews and Omar Sharif. Based on the 1971 novel The Tamarind Seed by Evelyn Anthony, the film is about a British Home Office functionary and a Soviet era attaché who are lovers involved in Cold War intrigue. The Tamarind Seed was the first film produced by Lorimar Productions. The film score was composed by John Barry. An attractive British Home Office assistant named Judith Farrow (Julie Andrews) is on vacation on the Caribbean island of Barbados after ending a failed love affair with married Group Captain Richard Paterson (David Baron), an important British minister. She meets Feodor Sverdlov (Omar Sharif), a Soviet military attaché who is also on vacation staying in an adjacent bungalow. The two spend time together exploring the island, visiting museums, and going out to dinner. When British intelligence learns that Sverdlov is spending time with the mistress of a British minister, they begin monitoring their actions. Judith and Sverdlov share details about their private lives—about her husband who died in a car crash, her recent unhappy affair, his unhappy marriage, and his disillusion with the Soviet Union. During one of their outings, Judith becomes fascinated by the story of a slave who was hanged from a tamarind tree and how that tree has since borne seeds in the shape of a human head. The skeptical Sverdlov thinks the story is a mere fairy tale. On her way back to London, she opens an envelope he gave her and finds a tamarind seed. British intelligence officer Jack Loder (Anthony Quayle) is convinced that Sverdlov is planning to recruit Judith as a spy. Loder is already concerned about an unknown Soviet spy within the British government with the code name "Blue". When he meets with British minister Fergus Stephenson (Dan O'Herlihy), he learns that Stephenson suspects that his wife was given secret intelligence information and wants the man identified. Loder knows that his own assistant George MacLeod (Bryan Marshall) has been having an affair with Stephenson's wife Margaret (Sylvia Syms) and is the source of the leak. Later, Stephenson reveals to Paterson that British intelligence knows about his affair, and that his former mistress has been identified as a security risk based on her contact with Sverdlov. Paterson is instructed to break off all communication with her. Loder visits Judith in her London apartment and interrogates her about Sverdlov, who is assigned in Paris to Soviet General Golitsyn. Loder instructs her that if he contacts her again she should tell him immediately. Meanwhile, when Sverdlov returns to his Paris office, he is told that his longtime secretary was taken ill and returned to Russia, replaced by another secretary he suspects is a plant. He tells General Golitsyn that he's made a contact in Barbados, and that he believes he can recruit her. Soon after, Sverdlov meets Judith in London, and she reveals that British intelligence knows about them—just as he suspected. He tells her that he's told the general that he intends to recruit her—a pretense for seeing her again. Meanwhile, Stephenson's suspicious wife Margaret figures out that her husband's cigarette lighter is a miniature camera and that her husband is in fact a Communist spy. She does not know that British intelligence has been searching for the identity of her husband—given the code name Blue. Soon after, Judith receives an important message for Sverdlov, who is back in Paris. When she phones him, he asks her to deliver it to him in Paris. When she arrives, she conveys the message—that his former secretary was taken to Lubyanka for interrogation by the KGB, and that he should not return to Russia. When Sverdlov shows interest in seeking asylum in the West, Judith contacts her former lover Paterson, who communicates her request to Loder. The next night, Sverdlov is brought to Judith's apartment to meet Loder and asks for asylum. He offers to provide the identity of the secret Communist spy Blue, in return for a safe new life in Canada. Loder agrees to the deal. To help Sverdlov pull off the defection, she agrees to accompany him back to Barbados so that his cover story with the Soviets will be convincing. Loder agrees to help arrange their rendezvous. Meanwhile, at a party at the British ambassador's house in Paris, Paterson's wife reveals to Stephenson's wife that she overheard Judith tell her husband about a Soviet official looking to defect. Stephenson's wife reveals this news to her husband, who suspects Sverdlov to be the defector. The next day, Stephenson meets his Soviet contact and communicates the information. In Paris, Sverdlov meets with General Golitsyn and assures him that he only needs a few more days with Judith to recruit her. At the Soviet embassy, Sverdlov steals part of the secret file on the Communist spy known as Blue—papers he intends to offer to British intelligence in exchange for his asylum. As he is leaving, however, he is spotted hiding the papers inside his jacket. When General Golitsyn is informed, he orders Sverdlov's public assassination at Heathrow Airport in London before he can fly to Barbados with Judith. At the airport, the Soviet assassins await his arrival, but Sverdlov avoids them with the help of Loder. General Golitsyn sends his assassins to Barbados to complete their deadly mission. Meanwhile, Loder meets with Stephenson and updates him on Sverdlov's defection and the secret Blue files that will reveal the identity of the Soviet spy in the British government. In Barbados, Judith and Sverdlov enjoy a beautiful sunset together and finally make love. The next morning, the Soviet assassins arrive at the island by boat disguised as vacationing businessmen. They blow up Sverdlov's bungalow with napalm grenades and a fierce gunfight ensues between the killers and the British intelligence agents protecting Sverdlov. Afterwards, news reports indicate that Sverdlov was killed and Judith was taken to the hospital with injuries. Back in London, after telling Stephenson that the Blue files were destroyed in the fire, Loder reveals to his assistant that he knows that Stephenson is Blue and will be taken care of in time. Loder then travels to Barbados to visit Judith who is recovering from her injuries at St Patricia Nursing Home, Barbados. He tells her that actually Sverdlov was not killed as reported, but was taken out of the bungalow just before the attack. He is safe in Canada and if she wants to visit him, it could be arranged. Sometime later, Judith and Sverdlov are reunited in Canada. The novel was published in 1971. It was Andrews' first film in four years, since Darling Lili. During that time she had married Blake Edwards and concentrated on raising their children. "This is a nice film," said Andrews. "It's just right for my comeback." The Tamarind Seed was filmed on location in Barbados, Eaton Square, Belgravia in London, England, and Paris, France. The film received a Royal Command Performance. Lew Grade said the film "did fairly well" at the box office but claims that he struggled to make much money out of the movie because Blake Edwards and Julie Andrews took such a large percentage of the profits (Andrews 10% of the gross, Edwards 5%). This was common practice for a top-billed star and writer/director to do so since their attached names are what, usually, bring in the larger audiences and greater gross profits for a lower budget film. Characteristically, the last bastion of stability and decency resides in the community of two, lovers whose loyalty and commitment to each other may momentarily transcend—but is ultimately and perfunctorily done in by—Cold War games. The games themselves have grown overly familiar and predictably nihilistic: means are expended to achieve ends that possess reality only to those unknown bookkeepers who keep track of the debits and assets of international espionage. ... The system kills—by moral attrition, or violently, physically—but always the abstraction of international security is best preserved by a terrible and wasteful expenditure of human resources. By debasing the moral coinage that allows men and women to deal with one another with even minimal trust or affection, the world is made safe for ... well, not people, but ... something. Murphy concluded that The Tamarind Seed turns this genre of "the community of two" into the genuine article that "shifts and reshapes our thinking and feeling and seeing". In its place, a "new perception of reality" transcends the confines of the movie theater and makes its way into the "larger, less defined, and thus less understandable, territory of our lives". The film was spoofed in Mad magazine in 1975 as The Tommy-Red Seed. ^ a b CRITIC AT LARGE: Tide Turns for Blake Edwards Champlin, Charles. Los Angeles Times (1923-Current File) [Los Angeles, Calif] 18 Apr 1975: 26a. ^ a b c Brenner, Paul. "The Tamarind Seed". Allmovie. Retrieved March 8, 2013. ^ 'I haven't been a spy myself.... What they had proposed was, I thought, extremely dangerous, and being a coward I declined': EVELYN ANTHONY talks to CATHERINE STOTT The Guardian (1959-2003) [London (UK)] 06 Aug 1971: 7. ^ Energetic Julie Andrews Takes on TV NORMA LEE BROWNING. Chicago Tribune (1963-Current file) [Chicago, Ill] 08 Oct 1972: n1. ^ A Gee Rating for Julie in 'The Tamarind Seed': Gee Rating for Julie in 'Tamarind Seed' Hall, William. Los Angeles Times (1923-Current File) [Los Angeles, Calif] 01 July 1973: n1. ^ "Locations for The Tamarin Seed". Internet Movie Database. Retrieved March 8, 2013. ^ Richard Harris is 99 44/100% recovered Norma Lee Browning. Chicago Tribune (1963-Current file) [Chicago, Ill] 06 Dec 1973: c17. ^ a b c d Murphy, Kathleen (September 1974). "A Community of Two: Blake Edwards's 'The Tamarind Seed'". Movietone News 35. Retrieved March 9, 2013. Anthony, Evelyn (1971). The Tamarind Seed. London: Hutchinson. ISBN 978-0091080402. Wasson, Sam (2009). A Splurch in the Kisser: The Movies of Blake Edwards. Middletown: Wesleyan University Press. ISBN 978-0819569158.